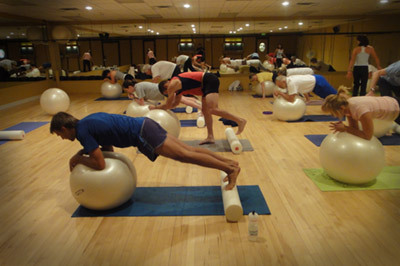 Club USA’s Core Connection Studio is where Mind/Body classes like yoga and pilates are held. When Heated Empowering Yoga is held in this 1,700 sq. ft. yoga and pilates studio, the room is heated so as to exhilarate the body, mind, and spirit, emphasize movement, and detoxify. For Littleton yoga classes, there’s nowhere else like it. Vinyasa yoga is a series of flowing yoga poses that focus on your inhalation and exhalation. Often referred to as vinyasa flow or just flow, this is a smooth, dance-like and rhythmic form of yoga. Vinyasa yoga provides both mental and physical benefits because it works to re-energize the body and mind. Calming synchronized breathing is relaxes the mind, and physical moves expel toxins through sweat. Vinyasa is a great option for everyone from yoga beginners to advanced yoga practitioners, making it one of our most popular Littleton yoga options. Sun salutations are one of the most common poses, but sequences vary depending on the instructor and the class’s difficulty level. Hatha Yoga is a Sanskrit word that is combined from two smaller words: ha, meaning “sun,” and tha, meaning “moon.” Hatha may also mean “willful,” “fearful,” or “forceful.” Hatha yoga is one of the many Littleton yoga offerings at Club USA. The practice of Hatha yoga focuses on mastery of your physical body, including all bodily functions. It also emphasizes activating the chakras to stimulate kundalini and promote spiritual and physical wellness as well as promote disease elimination. Meditation Yoga classes promote awareness. Anything you do with awareness is meditation. “Watching your breath” is a kind of meditation. 15-minutes of meditation takes place after all of our Littleton yoga classes. These activities are free from any other distraction to the mind, which is the key to effective meditation. Empowering Yoga Sculpt is one of our high-intensity yoga classes. It integrates yoga postures with light weights to increase your lean muscle mass, coordination, cardiorespiratory strength, and your endurance. It is a full-body workout that tones your muscles and clears your mind. This intense Littleton yoga class boosts your metabolism and builds your lean muscle mass as you move to fun, upbeat music. You’ll combine free weights with cardio and Yoga II sequences to intensify every yoga pose while still mixing in strength-training moves like squats, bicep curls, and lunges. Take the challenge of the hottest trend in Yoga! We add light hand weights for an intense yoga practice. Barre Fusion 5280 classes are a whole-body workout using an effective blend of ballet, dance, and fitness movements at the barre in our Core Connection pilates studio. We use hand-held weights for your upper body, creative leg combinations that will leave your legs sleek and defined, and isometrics to sculpt ROCK HARD ABS. Barre Fusion will trim, tighten, and tone your whole body. The Barre Class will engage your smaller accessory muscles in addition to your larger muscle groups. With a regimen that includes isolating, overloading, and stretching each muscle group, one by one, our client’s bodies become longer and leaner. The Barre Fusion Class combines several techniques to accomplish your goals. You’ll get pilates, yoga, dance, cardio, and even some classes with boxing! Core Conditioning classes are a tremendous balance challenge class for all ages and levels of participants. This class is also known as “On the Ball.” Take the class to create strength throughout your core and develop the best stability with the full body workout. View Schedule for Littleton yoga, pilates, and more.